Common redpolls are named for the red patch, or “red poll,” that both males and females have on their forehead. These small visitors from the north tend to appear every two years. March has been a wintry lion in Westborough this year, so perhaps it’s not surprising that one group of northern visitors – a flock of common redpolls – has still been seen in town well into the month, even as local birds begin to sing and other birds start arriving from the south. 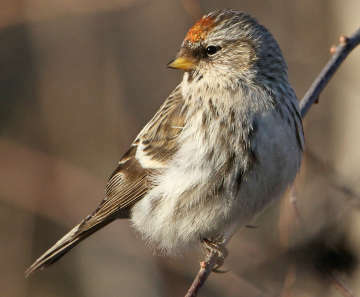 Common redpolls (Acanthis flammea) live year-round and breed in the far northern parts of Alaska and Canada. Like this year’s other northern visitors – the pine siskins and pine grosbeaks that also appeared in Westborough – they move south only in some years, when their usual winter food supplies are scarce up north. For common redpolls, that usually means a poor crop of birch seeds. If you like our resident black-capped chickadees (Massachusetts’ state bird), you’ll enjoy the visiting redpolls. Both are small birds, more or less 5-inches long, and very acrobatic and fun to watch. Our chickadees have their famous black cap, while redpolls have a bright red patch on the forehead, which gives them their name. Male redpolls typically also have some red on the body, in a vest-like pattern. Any bird that sports a red color is welcome sight in a New England winter. At this time of year, both kinds of bird travel in flocks, so if you spot one bird, it pays to look and listen for others. You may have noticed that small chickadee flocks often have some other birds traveling with them – maybe a nuthatch or two, and a downy woodpecker. The redpoll flocks, on the other hand, are generally all redpolls. Very occasionally, there might be a whiter-looking hoary redpoll (Acanthis hornemanni) among the common redpolls. Hoary redpolls live in a range that extends even farther north than the common redpolls’ range, and they rarely make it this far south. Considering how far north redpolls usually live, we’d certainly expect them to good at surviving the cold. They’ve been known to withstand temperatures of minus-65 degrees Fahrenheit, something they’ll find in Alaska but not around here, thank goodness. One big help is their heavy winter coat of feathers, which is literally about 30-percent heavier than their summer coat. They put on fat, of course, but also muscle, which generates body heat when the birds shiver. On the other hand, redpolls can’t take high temperatures of more than about 99-degrees Fahrenheit. Redpolls also have a habit of burrowing into deep snow for the night, when temperatures are coldest. They simply drop down into the snow, sinking as deep as four inches and making a tunnel up to 16-inches long. Near dawn, a burst of flight frees them from their snowy blanket. To generate body heat in the cold, these little birds have to eat well. To help them do so, they store seeds in an expandable section of their throat. They can quickly gather and store a lot of seeds and then fly off to a protected spot to eat them. They can also stash a night-time snack in their throat, which can hold enough seeds to supply about 25 percent of their daily energy needs. Birch seeds, their favorite winter food up north, are a high-energy food for them. In our area, we might see redpolls in weedy open areas or fields edged with birch and alder. A flock will settle briefly to pick seeds from the dried plants or from the ground, and then fly up and away, either to a nearby spot or farther away. These small birds make tasty morsels for birds of prey or pet cats, so their habit of not settling in one place for very long makes survival sense. Redpolls are quite social, and there’s quite a bit of chattering in a flock. Outside you might hear a faint twittering before you see a flock moving in your direction. These lingering visitors are likely to depart in April. They’ll head for the arctic areas where they breed. There the summer days will be long, with 20 hours of daylight, and they will be able to nest in scrubby or dwarf shrubs and feed their young with briefly plentiful insects. When will we see them again? It’s hard to say for sure, but they tend to move south more frequently and regularly than the pine siskins and pine grosbeaks that also came here this winter. Common redpolls usually appear in many part of the U.S. every other year. Your best bet may be to look for them again in two years, in the winter of 2014-2015, but it never hurts to watch for them every winter. Nature isn’t totally predictable.